This week has been a big week in immigration reform: legislation in the Senate and the House are both making significant progress, and even conservative Senator Rand Paul announced his support of a pathway to legalization on Tuesday. With this progress in mind, it is important to get the facts straight on what impact this will have on the budget and the economy in general. The left-leaning Center for American Progress (CAP) took a stab at this, releasing a new paper on Wednesday on the economic impact of legalizing the 11 million undocumented immigrants in the U.S. It estimated that legalization alone would, over the next ten years, increase the earnings of undocumented immigrants by $392 billion, add $832 billion to the nation’s GDP, and increase tax revenue by $109 billion. The CAP study has two major strengths. First, it controls for many other factors that influence income – such as age, year of arrival in the U.S., education level, state of residency, etc – providing a good apples-to-apples comparison. Second, it tends to use the more conservative end of any range of estimates, avoiding potential exaggeration of the effect. However, the tax revenue changes are misleading, especially for the latter two scenarios involving citizenship. Although undocumented immigrants still wouldn’t qualify for welfare programs like SNAP, Medicaid, and CHIP if granted legalization, they would be eligible if they were granted citizenship. The CAP study fails to account for any potential negative fiscal impact as a result of this access to welfare programs through citizenship. 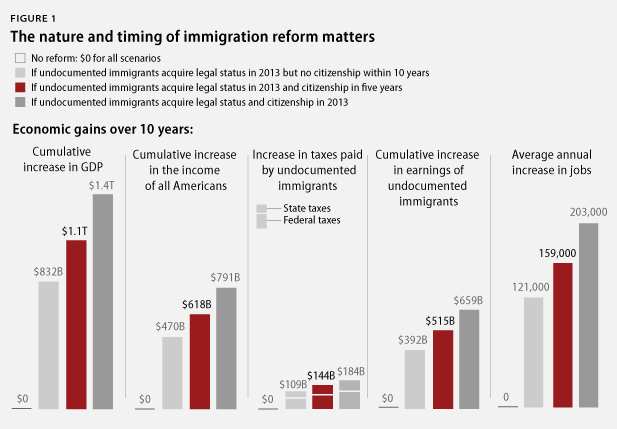 In doing so, they overstate the increase in tax revenue as a result of granting citizenship to undocumented workers. In 2007, the Congressional Budget Office estimated the impact of granting citizenship to illegal immigrants. They found that while tax revenue would increase by $48 billion over ten years, direct spending and discretionary spending would increase by $23 billion and $43 billion respectively, resulting in a net negative fiscal impact of $18 billion. This suggests that a comparable estimate today would show that the fiscal burden is not negligible. Therefore, CAP’s figures on the change in tax revenue provide an incomplete picture of the real effect of granting citizenship. It has been six years since the CBO ran these estimates. As we draw closer to passing an immigration reform bill, we need an update on how legalization and/or citizenship would impact the budget and the economy at large. The CAP paper is a good start, but it’s not the whole story. Tags: Center for American Progress, Immigration, pathway to citizenship, Rand Paul. Bookmark the permalink.